A major right-of-centre lobby group linked to a network of Brexit campaigners has admitted illegally sacking the whistleblower who first revealed allegations of unlawful referendum campaign spending. Shahmir Sanni was fired by the TaxPayers' Alliance after revealing his concerns that the official Brexit campaign, where he had previously volunteered, had broken electoral law. In his employment tribunal claim, Mr Sanni said the TPA had unfairly dismissed him after his decision to go public - and the organisation was part of an attempt to smear him. The lobby group now faces paying damages to Mr Sanni after an Employment Tribunal judgement last Thursday confirmed it would not contest his claims. Who is Shahmir Sanni and what did he do? Mr Sanni volunteered to work for Vote Leave, the official Brexit campaign body, during the referendum. He was then asked to work for Be Leave, an organisation targeting young voters. After the referendum, Mr Sanni supplied evidence to the Electoral Commission and the media that the two organisations had broken spending rules - and were in effect jointly run. In July, the commission - the independent watchdog that monitors ballot box fairness - found Vote Leave and Be Leave had committed "serious breaches" of the law by working together, and therefore overspending, and it called in the Metropolitan Police. Why was Mr Sanni sacked from the TaxPayers' Alliance? After the referendum, Mr Sanni took a job with the TPA - a group which campaigns for lower taxes and highlights examples of government waste. He later told its chief executive, John O'Connell, about his plan to go public with his evidence of suspected breaches of electoral law. According to legal papers in the case, Mr O'Connell then advised Mr Sanni not to do so. The Employment Tribunal was told that after he disclosed his suspicions in the media, Mr Sanni was sacked by Mr O'Connell. In the legal papers, Mr Sanni said he'd been unfairly dismissed because he had exposed wrongdoing which had reflected badly on his employer because of its association with other pro-Brexit groups. Lawyers for Mr Sanni told the tribunal that if the TaxPayers' Alliance fought the case, they would demand disclosure of communications between nine organisations linked to the same Westminster offices, 55 Tufton Street, which shared political goals, including leaving the European Union. These groups would typically attend a regular co-ordination meeting as part of their political campaigning. "The claimant believes that some or all of the nine entities materially influenced the TaxPayers' Alliance's decision to dismiss him," the tribunal was told. "The claimant believes that his [whistleblowing was]... discussed at a Tuesday meeting, and that a concerted response... was discussed and agreed between the nine entities, and that this response included his dismissal," the tribunal was told. Who are the nine entities named in the legal papers? Jonathan Isaby, the former head of the TaxPayers' Alliance and now editor of Brexit Central, told the BBC the Tuesday meetings were not as described in the legal action and denied they played any role in the affair. "In a personal capacity I chair the monthly Tuesday meeting of individuals on the broad centre-right with an interest in public policy, which is typically attended by anything between 40 and 100 people," said Mr Isaby. "Attendees advertise recent policy work, promote forthcoming events and occasionally hear from guest speakers. "I can categorically state that Mr Sanni has never been the subject of a discussion at any such meeting." 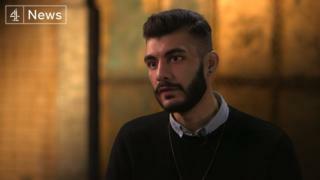 Shahmir Sanni has previously also alleged that after his decision to go public he was outed as gay in an official Downing Street communication. He is still pursuing a separate legal action in relation to his outing. A spokesman for Downing Street has said it cannot comment on ongoing legal proceedings. What has Mr Sanni said? "I have been denigrated by former colleagues in print and on television as a liar and fantasist," said Mr Sanni in a statement. "I was threatened with a libel suit for saying that I would be instigating this litigation. But when confronted with the reality of having to defend their actions, the TaxPayers' Alliance saw there was no chance that they could successfully do so. "They folded at the first opportunity, and are now avoiding any further questions about their funding and a shadowy network of right-wing organisations." What has been the response from the TPA? In its legal papers, the TPA confirmed that it would not fight the employment case - although it insisted that its decision to concede was based on "pragmatic grounds". In a further statement to the BBC, Mr O'Connell said that concessions on points of employment law did not mean "we conceded on the entirety of their original submission".